You can add your TWO most favorite (and expensive!!) stamp sets to your Starter Kit for FREE!! Yep. Order a Stampin' Up! Starter Kit and you get all kinds of great perks, but if you join by June 30th you can add two stamp sets from the new catalog for FREE. That's kind of a big deal!! 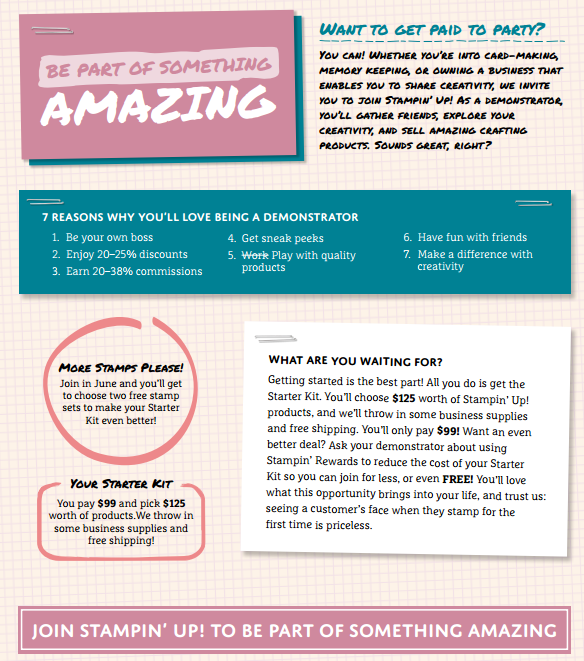 If you're interested in just the discount and creative resources, but not so much the business side, that's OK! I started out only buying for myself, enjoying the discount and all the other great resources available to demonstrators! There is no pressure to sell, and and you can spend as much or as little as you like. The Starter Kit and everything you choose in it is yours to keep, and it really is a steal of a deal!! The discount saves you money, and the perks of pre-orders and special offers for Demonstrators are very fun! The Holiday catalog will be coming out soon, and you'll be set to save on supplies for holiday gifts, cards, and more! If you're interested in starting a business, you will be amazed at the resources and support - and great bonus offers you can earn as a Demonstrator! Stampin' Up! is a great company to sign with, and I'm here to support and cheer you on as you work towards your goals. Whether its to pay for classes or sports for the kids, save for a big vacation, or to add some cushion to the family budget, you can do it - I can show you how. The holiday season will be here sooner than you think, a GREAT time to start your business and set yourself up for success is NOW. Or contact me today with your questions! and how you can benefit as a part of my team.